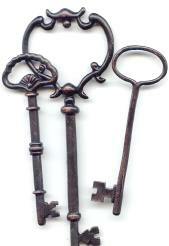 Antique Charm Copper Keys~These keys are flat backed and acid free, ready to use in your scrapbooking. Each key measures approx. 1 3/4" tall and approx. 3/4" at the top. You could hang the keys on a string in a row on your scrapbook pages. Their flat backs make them adaptable for many other uses. Pkg. of 4. 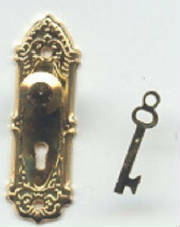 Victorian Style Keys- Set 1~ Everyone seems to loves these, they have sold out at each convention. These are big keys, the largest is 4 3/4" long, the others are approx. 3 1/4" long. IMany customers have told me they were using them in their home decor. 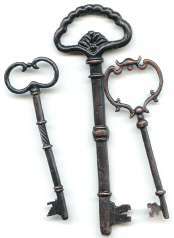 How about a castle key? They will add a distinctive touch anyway you choose to use them. Clear Vintage Key Sticker Collection~Archival quality and hand drawn appeal. You get keys, clocks, ink wells & feather pens, 17 stickers in all. Door Knob & Key Set~ These are just too cute! The door knob measures approx. 1" and the key measures approx. 1/2" and comes in brightly polished gold tone. Just think of the possibilities with this fun embellishment. The uses are endless. Package of 2. Metal Key Corners~Self adhesive metal corners with raised antique key design. Diagonally they measure almost 1 3/4" long. The mid point measures approx. 3/4" wide. Pkg. of 4. Nostalgique Keys & Locks Clear Stickers~Photo safe stickers. A collection of 18 vintage style keys & locks. Try them in conjunction with our library pockets (book making supplies page), dominos and/or our artist grade microscope slides.